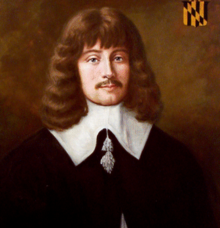 Following his brother's instructions, Leonard Calvert at first attempted to govern the country in an absolutist way, but in January 1635, he had to summon a colonial assembly, which became the foundation and first session of the modern General Assembly of Maryland, the third legislature to be established in the English colonies, after the House of Burgesses in the Dominion of Virginia, and the General Court in the Commonwealth of Massachusetts. In 1638, the Assembly forced him to govern according to the common law of England, and subsequently the right to initiate legislation passed to the new General Assembly, representing the common "freeholders" (owners of freehold property) as subjects of the Crown. In 1638, Calvert seized a trading post at Kent Island established by the Virginian William Claiborne. In 1643, Governor Calvert went to England to discuss policies with his brother Lord Baltimore, the proprietor, leaving the affairs of the colony in charge of acting Governor Giles Brent, his brother-in-law (he had married Ann Brent, daughter of Richard Brent). Calvert returned to Maryland in 1644 with a new wife and children (William, born in 1643, and a daughter, born in 1644). That same year, Claiborne returned and led an uprising of Maryland Protestants against the Catholic Proprietor. Calvert was soon forced to flee southward to Virginia. He returned at the head of an armed force in 1646 and reasserted proprietarial rule. Leonard Calvert died of an illness in the summer of 1647. Before he died, he wrote a will naming Margaret Brent (the sister of Giles, and a future-historically famous planter, lawyer, and female advocate for women's rights) as the executor of his estate. Calvert also named his friend and fellow passenger aboard The Ark and The Dove, Thomas Greene, as his successor to the governorship. In 1890, the State of Maryland erected an obelisk monument to Calvert and his wife at Historic St. Mary's City which had a historical district created to commemorate the colonial origins of the colony. The location of Leonard Calvert's grave has been lost to history, but there is an effort underway to find it. Archeologists based in the Historic St. Mary's City research complex believe that Leonard Calvert is buried somewhere in St. Inigoes, Maryland. The most likely spot has been narrowed down to somewhere on Webster Field, now a small U.S. Naval Aircraft facility located on the water on the Western side of St. Inigoes. Several archeological digs have been conducted but the grave has yet to be discovered. Members of the Calvert family in the settlement were known to be buried in lead coffins. It is not known if this is how Leonard Calvert was buried. His death, due to disease, happened suddenly and unexpectedly after a period of religious warfare had wracked the colony. Soon after his death, one of the first laws requiring religious tolerance was written and enacted in the colony, further codifying its original proprietarial mandate of religious tolerance and reestablishing peace. ^ "Leonard Calvert MSA SC 3520-198". Maryland State Archives. March 7, 2003. ^ a b c d Sparks, Jared (1846). The Library of American Biography: George Calvert, the first Lord Baltimore. Boston: Charles C. Little and James Brown. pp. 16-. ^ Krugler, John (2004). English and Catholic: The Lords Baltimore in the Seventeenth Century. Baltimore, MD: Johns Hopkins University Press. p. 28. ^ Herbermann, Charles, ed. (1913). "Calvert" . Catholic Encyclopedia. New York: Robert Appleton Company. Dictionary of American Biography Base Set. American Council of Learned Societies, 1928–1936. Wikisource has the text of an 1879 American Cyclopædia article about Leonard Calvert.